A riot in San Quentin provides an opportunity for Boston Blackie to escape. On his way to Mother McGinn's, Blackie saves Mary McGinn from a runaway horse. A riot in San Quentin provides an opportunity for Boston Blackie to escape. On his way to Mother McGinn's, Blackie saves Mary McGinn from a runaway horse. Mary decides to help him out and unknowingly assists him in evading the police. Mother McGinn, whose home is a refuge for criminals, has concealed from her daughter, Mary, the fact that her father died in prison. She finds out through Blackie that her father, now dead, and her brothers are all crooks, something that has been hidden from her by her mother. Mother McGinn has been running the boarding house to pay for Mary's expensive schooling. When detectives inform school administrators the truth about her father and that she helped an escaped con, Mary is expelled. Mary has fallen in love with Blackie and will do anything to make him go straight -- even to join his gang. Her attempts to reform him are frustrated at first but finally wakes him up to his wrongdoing, and Mary convinces him to complete his prison sentence so that there will be nothing standing in the way of their future. 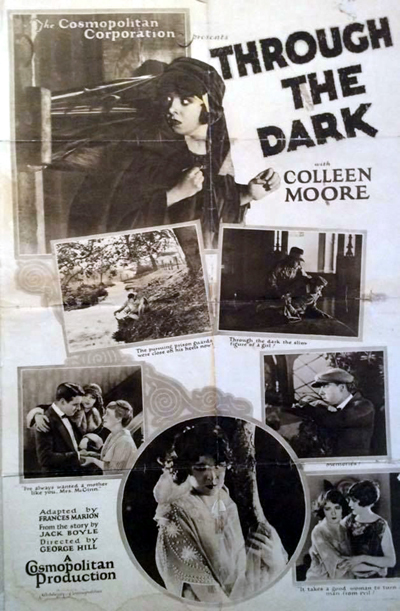 Colleen Moore has a star on the Walk of Fame in the Motion Pictures Category, Star Rank 1552. The address is 1597 Vine Street, between Selma and Sunset, west side, GPS 34.099429,-118.326814. Hobart Bosworth has a star on the Walk of Fame in the Motion Pictures Category, Star Rank 1799. The address is 6524 Hollywood Blvd, between Schrader and Wilcox, south side, GPS 34.101472,-118.331934.